Windows Hive news Windows 10 will support ported Android and iOS apps! Is it good or bad? Windows 10 will support ported Android and iOS apps! Is it good or bad? There had been a ton of rumours and predictions that Microsoft will take this road and abandon windows. And its also true that Microsoft has been trying to emulate android apps to run on windows. But may be they realised that its very difficult and not good for them and seems to have settled with a set of partial solutions which will enable existing android and iOS developers to use their existing code directly and actually make the app work on windows 10. Android and iOS developers can port their apps into universal windows apps using the two new development kits that were being released by Microsoft. 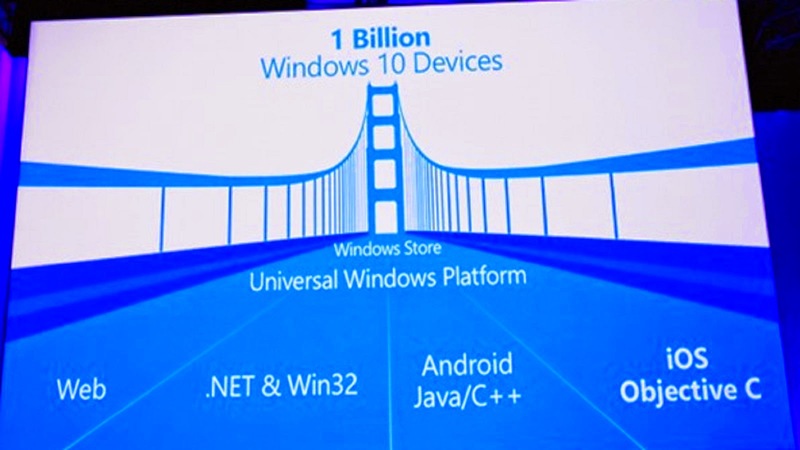 And also they announced that developers can now use JAVA and C++ to make apps on Windows 10 which will enable Android developers to easily port their apps. And for iOS developers can directly use their existing objective c code and make it work on windows 10. Ah not exactly. You see in Android most apps use a number of Google's API's which wont work on windows so Microsoft has created API replacements for those things. So they have to replace each and every google api they use in the app with a related Microsoft API. And then the app will work. Developers can even add support for Cortana, Live tiles, holograms, Xbox live and many more exclusive windows features. Sounds Great when will this thing be available? Actually its already in works. You remember the Candy Crush Saga game that arrived recently in the store. It was a direct port from iOS. Microsoft has been testing this feature for a while in partnership with King. And the app is also performing very well in the store too. Android apps .... Virus Problem? Don't worry about it. All these apps will run in a sandbox so anything that gets installed with app stays there it wont impact the rest of the system. And your security is never compromised. Android and iOS apps coming to windows! Does it mean doomsday for Native Windows developers ? Actually its a big no. Microsoft is just trying to help android and iOS developers bring their apps to windows. that doesn't mean Microsoft has neglected the native windows developers. And these ported apps, they wont be a match for native windows apps because ported ones are not designed for windows and they cant use the true power of windows as of native apps. There will be restrictions, like only some apps can be ported and some can't be. Ported apps cant use some specific API's too. At first you may think its crazy but what Microsoft is doing is good for both developers and users of windows. And for the android and iOS developers out there who are thinking to make windows app, its still great to build your apps as a native windows app than making a ported one, if you make a ported one its also equally great. Lets join hands and welcome them to our windows community. Finally What do you think about this announcement by Microsoft? fire it in the comments section.